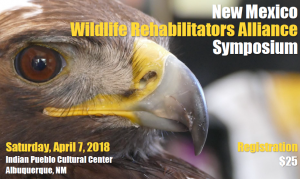 New Mexico Wildlife Rehabilitators’ Alliance Symposium /Hawks Aloft Inc.
On Saturday, April 7, Hawks Aloft is very pleased to be hosting the inaugural event from the New Mexico Wildlife Rehabilitators’ Alliance. This one-day symposium will happen in conjunction of two days of classes brought to us by the International Wildlife Rehabilitation Council. The IWRC is putting on two full-day classes–one in basic wildlife rehabilitation, and the other on pain and wound management. On the third day of the symposium, the New Mexico Wildlife Rehabilitators’ Alliance will convene for educational sessions that address the impacts of energy development on wildlife, the 30-year Eagle Law, and extended discussion of permitting, laws, regulations, and how we can increase collaboration for the benefit of wildlife throughout the region. Head over to our event page to register for the event!